Hi, my name is Meghan. I'm wife to Chris and stay-at-home-mommy to my 14 month old son, Noah. I blog over at The Adventure Starts Here about anything and everything in my daily life. 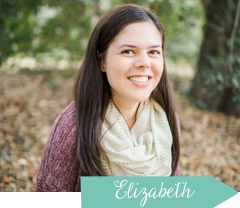 I am so excited to be a part of Elizabeth's new series, Boy Moms! I have been an avid reader of Erinn's Girl Moms series, and I can't wait to meet some more boy moms! Let me give you some background. When I was in high school, I envisioned having 4 kids. That has since changed, but at the time, I thought it would be fun to have 3 boys, and 1 girl (like you get a say in these kind of things). I grew up being the only girl and had an awesome relationship with my mom, and still do. My mom was also the only daughter and had a great relationship with her mom as well. I hoped to have the same thing. I love the idea of having a daughter, having fun dressing her, going shopping, doing all those girly things, and in general just being her best friend. But after having my one daughter, I always imagined having the rest be boys. I babysat a lot throughout high school and college. For some reason, I always seemed to have more fun playing with the little boys. I even babysat twin toddlers, a boy and a girl. The little boy was the one who wanted to sit and cuddle with me while we watched TV and was interested in playing with me, while the little girl was more independent. I guess from my experiences, I always thought boys were really a lot of fun. Many years later, I was now pregnant with my own child. Chris and I knew that we wanted to know the gender as soon as it was possible. For weeks, we made guesses and asked our friends and family what they thought. Chris has lots of cousins, there are 17 of them on his dad's side. Out of those 17, only 3 are girls. As a result, most people assumed we'd have a boy. But for some reason, I thought we were having a girl. However, my subconscious disagreed. In every dream I had, we were having a boy. We had an ultrasound scheduled right around 20 weeks to find out. Chris and I had been brainstorming ideas on how we would announce the gender. When Chris found these cute "It's a Boy" and "It's a Girl" elephant cookies at our grocery store, he knew they had to be involved (since I LOVE elephants). Before our appointment, we took pictures with both cookies, so that as soon as we found out, we could send this picture to our family and friends, and then eventually post on Facebook. We went for the ultrasound, and that's where we learned we were having a little boy! With all the trouble we had getting pregnant, I honestly can say that I was just relieved to know that our baby was healthy! And while it would have been fun to decorate a girl nursery and shop for girly clothes, I was super excited that we were having a little boy. I immediately started designing the nursery and my mom started buying way too many clothes! At that moment, it all became very real and I started imagining what life would be like with my little boy. Ever since Noah was born, I was in love! He's my best friend, and it has just gotten better as he grows and becomes more interactive. While he enjoys his cars and balls as much as any little boy, his favorite toys are his kitchen, vacuum cleaner, and musical instruments. I think that regardless of having a boy or a girl, that the most fun and rewarding part of being a parent, is watching your child experience new things and see them grow into little people. I am honored to be Noah's mom and am excited to see him grow and learn each day. I can't wait to be his cheerleader, whether it's cheering him on from the sidelines of a game, going to see him in a play or a musical concert, or just supporting him in whatever interests he has. Thank you so much to Elizabeth for having me! If you would like to share a post about you and your son, email me at elizabethrose84@gmail.com .